Settled Blood is the second novel in what is well on the way to becoming an established series. There are no obvious spoilers here should you not read the books in order, and Settled Blood could easily be read as a stand alone. The series is built around DCI Kate Daniels, a tough but instantly engaging character that could almost have been tailor made for television (no doubt a small screen version will soon be in the pipeline). She heads up the MIT – the Murder Investigation Team – and is well respected and admired by her superiors and by those working in her team. As she returns to work after time spent recovering from injuries sustained during an earlier investigation, Kate’s first case is the enquiry into the discovery of the body of a young woman found in the Northumberland countryside beside Hadrians’s Wall. It’s strange enough that the woman was wearing clothes more suited to a night on the tiles than a day’s hiking but then the post mortem reveals that the woman has suffered injuries that suggest she was thrown from an aeroplane, most likely while she was still alive. Based on a description given to the police of the missing daughter of a wealthy County Durham businessman, the identity of the victim appears to be confirmed though there are no clues as to who might have been responsible for the young woman’s death. When Kate and her colleague DS Hank Gormley go to break the news to the missing girl’s father they find his staff strangely reluctant to help the police. As the team starts to investigate, they discover a web of secrets and deceits and as they begin to make sense of what they’ve learned, they realise that they must act quickly because another young woman’s life hangs in the balance. Mari Hannah worked in the probation service and her experience shows; the credible characters and dialogue demonstrate a first hand knowledge of today’s police force and capture the pressures of policing along with the camaraderie necessary to carry out such a difficult job. The other members of Kate’s team are not especially distinct or unusual compared with those in any other crime novel, but they are so well crafted that they are memorable and engaging. The portrayal of Lisa Carmichael a young and inexperienced officer wanting to make a good impression is a particularly well drawn character and I hope she appears in subsequent novels. 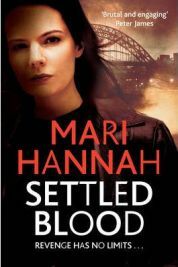 Settled Blood is a really tight piece of crime fiction with plenty for the reader to chew over without ever becoming too complicated and difficult to follow. The clues are there but Hannah keeps the story suspenseful right until the end. Chapters are just the right length to ensure the pages keep turning and end in such a way that you always feel you have to read just one more before putting the book down. Hannah’s writing is realistic and gritty without being overly fixated with violence or bad language but while she certainly knows her way round a good thriller, so to can she write with warmth and sensitivity. Kate’s back story is naturally the most developed; although she’s tough and determined, she also has a genuinely compassionate attitude towards crime victims that is quite unique in a female lead in crime fiction as such characters tend to avoid sentimentality on the grounds that it suggests weakness. As this story develops we see Kate dealing with her raw emotions having just split from her partner, whom she’ll still have to deal with on a professional basis. Although the wilds of rural Northumberland and Durham make a great setting for this novel, Hannah can give too much of the flavour of the environments she writes about. When characters move from one part of town to another there are running commentaries covering the exact route, naming individual streets and landmarks along the way. Real cafes and restaurants are named and, in the case of one well known upmarket eatery, given a mini review and recommendation. There is so much detail that I found myself focussing more attention on looking out for geographical errors than trying to work out whodunit. This irritation notwithstanding I’ve discovered an exciting new name in crime fiction, one that I suspect will become very well known. I’ve a feeling that television adaptations will follow at some point, but I hope that Mari Hannah is able to get a good few instalments under her belt before that happens. Next on my reading list is “The Murder Wall”, the first Kate Daniels novel, I can’t wait to read that first instalment. 2 Comments on "Settled Blood"
Mary, your review of Settled Blood has just been drawn to my attention. I hope you enjoy The Murder Wall too. The third in the series – Deadly Deceit – is due out in April 2013 and reviews like yours are really helpful in spreading the word. Thank you so much!